Movies.com > Movie News > M. Night Shyamalan on How People See His Movies, Plus: What '90s Rom-Com Did He Secretly Write? M. Night Shyamalan on How People See His Movies, Plus: What '90s Rom-Com Did He Secretly Write? You'd be forgiven for not knowing After Earth was cowritten and directed by M. Night Shyamalan. 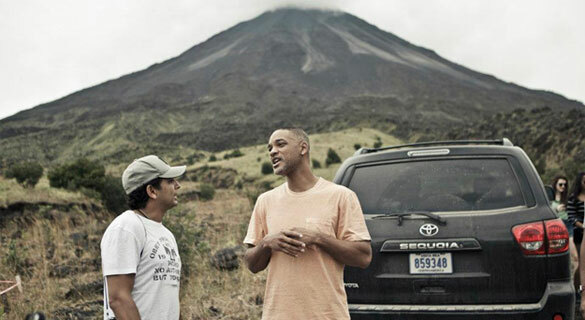 Will Smith and his son Jaden have been the key names in the movie's marketing campaign, and for obvious celebrity reasons. Plus, Shyamalan has been a bit of a punching bag lately; a sad side effect of what happens when you make a string of hit films followed by a few that aren't quite as popular. 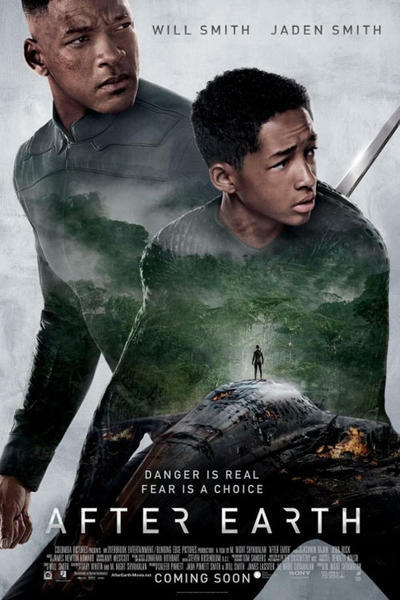 If you're someone who has written the director off, I say give After Earth a chance. This story -- about a father and son living 1,000 years in the future who are forced to crash-land their spaceship on Earth -- is a refreshing change of pace for an M. Night Shyamalan movie. It's an original, big-budget sci-fi movie with a very distinctive vision of the future and a refreshing way of putting a sci-fi spin on a wilderness survival movie. That begs the question, what truly defines a Shyamalan movie? Horror? Suspense? Mind-blowing plot twists? We had a phone chat with the surprisingly jovial director (the man's laugh is disarming and infectious) to talk about his latest film and what his brand as a director means to him. We'll be posting a second, more plot-specific portion of this interview after the film opens this weekend, but in the meantime enjoy this spoiler-free section. Movies.com: People have come to expect a certain something from an M. Night Shyamalan movie, so do you find yourself picking projects that are going to manage what has become this idea of you as a brand? Shyamalan: I guess I would say that I manage it in the sense that I try to make it more accurate. For example, you're saying the audience's relationship started with me with The Sixth Sense. That same year I wrote Stuart Little. That combination is pretty accurate. The breadth of that and my interest in that, the family-oriented nature of that story -- somewhere between there is where a lot of my movies fall, but if you don't take that side of it into account, it's probably more limiting than what my tastes are. Movies.com: We'd love to hear about it. Movies.com: That actually brings up an interesting aspect. When you have a career skyrocket like yours did, it's easy to imagine studio executives left and right bringing you in to try to attach you to things. Did you ever have that stage of your career where you shaped projects but never made them yourself? Shyamalan: It wasn't like that because I don't really develop. I don't have an arsenal of movies in my office that are connected to me and all that stuff. I'm strangely, creatively monogamous. It's something the people around me have always tried to change a little bit. It's so one at a time and I put my love and attention into one thing, and I don't want to have a bunch of attachments because it pulls my passion into too many different ways. I guess in the history of things, when they're considering a movie or offering me a movie, I'm immediately saying yes or no -- and if it's a yes, it's a, "Yes! Right now! Let's go!" It isn't a "Let's see," or "let's horde it." I'd probably be much wiser to do that, so I could have some stuff ready to go for a few years from now or when I felt something was appropriate, but so far my MO, and I don't if it's good or bad, has been to say yes or no. It makes me lean more on my original fare, stuff I'm writing for myself, and that's always really fun and rewarding and scary. You never know. The marketplace shifts in its open armed-ness to original fare. Movies.com: It's shifting back these days and people are craving it. Shyamalan: I agree with you. I think it really is. Movies.com: What kind of movies do you geek out about? Shyamalan: I don't know why these days, but I'm really into tonal movies. I'm into ones that are deep on control and tone; those are the ones that stick to me. It's not a law that it needs to be only a tonal movie, but it certainly is something that affects me. 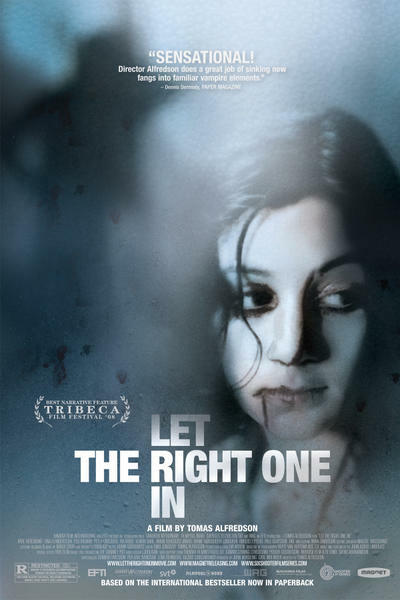 One of my favorite movies of the last several years is the original Let the Right One In. I literally finished watching it -- I had seen it by myself -- and I stood up looking around to find someone who could confirm I'd just watched this masterpiece. I just thought it was brilliant, tonally, but it had a lot of plot, actually. I connect to movies like Tree of Life, which are so bold on tone that they really mean a lot to me. Movies.com: It seems like some of that has rubbed off on After Earth. Don't take this the wrong way, but it's kind of a dorky movie. 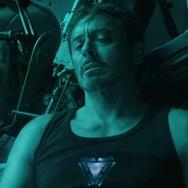 Movies.com: There's a lot to absorb and extrapolate on once it's ended. There's a lot of texture and function to their lives and world that isn't cleanly explained, and it doesn't need to be. What was the original run time of your first cut of it? 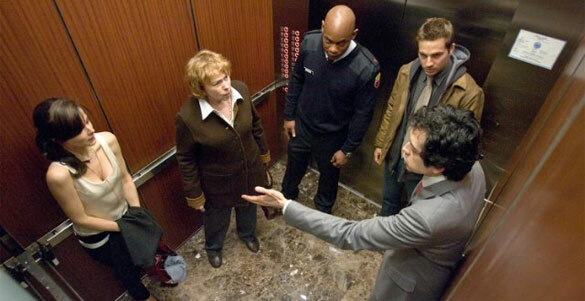 Shyamalan: If I remember right, probably about 20 minutes longer. It's pretty accurate to my history. My first cuts are usually 20-25 minutes longer than the final films. 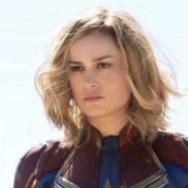 Movies.com: So it seems like this dorkier side – the language and the architecture and the ship design – was all from the design up. Shyamalan: That was definitely by design. The thing that was different about this movie for me versus my others was that I spent about a year doing nothing but designing those things that were meant to just be depth, and if you get them, you get them. The organic nature of the architecture and their world. This isn't a postapocalyptic movie in the way we normally think of one. Things haven't gotten darker, they've gotten lighter. We've rebooted and the civilization has kind of gotten better in how we're approaching things. Its influences are all in nature. Even the ship looks like a manta ray, and if you slice the ship in half, if you looked at the innards of it, it looks like coral. None of the hallways are straight. There's no right angles in this place, there's no steel. Everything is fibers. Movies.com: Do you have any guilty pleasure movies? Things that are comfort-food movies for you? Shyamalan: This is not guilty pleasure stuff, but I always have to go to some touchstone movie where no one would understand why I'm so connected to a movie, but they are kind of the father and the mother of the tone of a movie. And so this one is an Indian movie called Pather Panchali, and it's about a child who lives in a rural village and they're super poor and nature kind of imposes its will on the movie and is used very metaphorically. And that was a big inspiration for me. Movies.com: As a fan of Devil, are you guys doing any more Night Chronicles movies? Shyamalan: Yeah, definitely! I had such a fun time. I just saw those guys, the Dowdle Brothers, in Paris where I was on a publicity tour and they were shooting a movie. It would be great. I have a couple other ideas. I'm almost done with the script for the second one, I've just been sidetracked by directing my own movies, but hopefully within this year we'll get this one up and running and jump to the third one. Movies.com: Does that one have a title yet? Shyamalan: Well right now it's called Reincarnate. Movies.com: Is that the one Daniel Stamm was attached to? Shyamalan: Yes! Daniel's attached. He's such a great director. Movies.com: What's next for you as a director? Shyamalan: I'm doing a pilot for TV, and I'm overseeing all the writing of it, so it's really exciting. 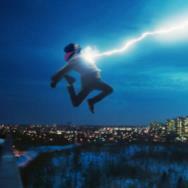 Movies.com: What about right now is enticing you to jump into TV for the first time? Shyamalan: I think it was a combination of two things. Right now, in TV there's an uptick in quality, and the kind of things that interest me in tone and character are really being celebrated, so when I look at The Killing or Homeland or Mad Men or Game of Thrones, there's a high level of cinema going on there that's really inspiring. And then this pilot they sent me called Wayward Pines, this specific story and the specific way it was executed really caught me. It has a Twin Peaks-y sort of vibe and I was immediately caught. Movies.com: And Wayward Pines is being sold as a mini-event, right? Just a handful of self-contained episodes? Shyamalan: Yeah, it's 10 episodes, and so we're trying to tell a story from beginning to end in those episodes. There's always a moment where a show is just vamping, and you as a viewer can tell they're just vamping. You want to have a sense of urgency so that people think you always have something important to say about the characters or plot, so this'll be a good format. Hopefully it'll be a successful venture.